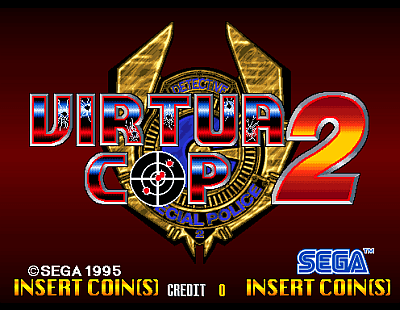 Virtua Cop 2 © 1995 Sega. 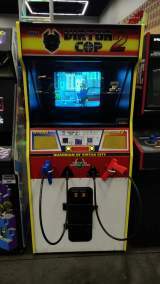 Runs on the Sega "Model 2A" hardware. 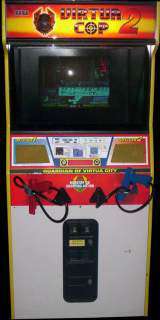 Virtua Cop 2 was released in September 1995 in Japan. [JP] Sega Saturn (nov.22, 1996) "Virtua Cop 2 [Model GS-9097]"
[US] Sega Saturn (nov.30, 1996) "Virtua Cop 2 [Model 81043]"
[EU] Sega Saturn (1997) "Virtua Cop 2 [Model MK81043-50]"
Sega Dreamcast [JP] (mar.2, 2000) "Virtua Cop 2 [Model HDR-0061]"
[JP] Sony PS2 (aug.15, 2002) "Virtua Cop Rebirth [Model SLPM-66205]"
[US] PC [MS Windows, CD-ROM] (nov.30, 1997) "Virtua Squad 2"
[EU] PC [MS Windows, CD-ROM] (2005) Sega Classics edition by Dice Multi Media.